Higher education qualifications in artificial intelligence are becoming more prevalent as the demand for these experts increases, companies such as NVIDIA are striving to train the next generation of AI experts, and UK Universities are suffering from a ‘brain drain’ as big tech companies are poaching AI experts and academics to drive their research teams. 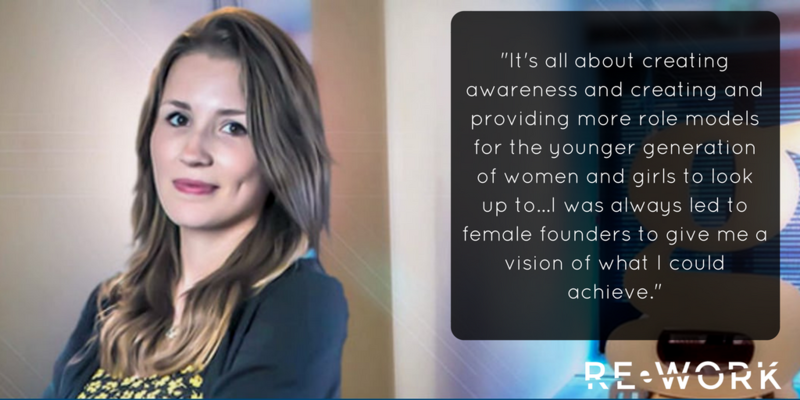 This increase in demand for talented minds is attracting more and more people into the field, however the industry is still vastly male dominated. Although there has been an increase of girls taking up computer science studies, currently only about 10% of A level entrants on the course this year were female. This barely improves in industry with 11% of software developers being women. Besides the obvious issue of equal opportunities and an over-saturation of male-only companies, many products that are lacking in female input and falling short in providing a service for the whole market. The Saudi robot, Sophie, created by a male team has been given citizenship in the country and has more rights than Saudi women. Back in 2014 when Apple first released the Health App, it promised comprehensive tracking features but women were left unsatisfied when they found an important feature missing: ‘The fact that Apple creates an entire built in health app to regulate essentially everything but leaves out a period tracker.’ Apple’s diversity report at the time did show that the company to be vastly male. Even with projected growth of 15-20% between 2012 and 2022, the vast majority of computer science jobs will be pursued and filled by men. ‘There is a clear disconnect between the computer science industry and the message girls receive about their ability to succeed in tech organizations.’ As an all female team, RE•WORK are passionate about not only supporting women working in AI but also encouraging girls into tech from a younger age. At each of our events we welcome students keen to learn more about the landscape of AI and the impact it has on business and society. As well as learning from women at the forefront of their industry and work in AI, we run the Women in AI podcast where we have the opportunity to discuss both their work and position in the industry as well as how they started out their careers in AI, and any advice that they could give to women or girls looking for a career in the space. We have recorded episodes with some really amazing women including Ira Kemelmacher, Facebook, - Layla El Asri, Maluuba, Anne Hsu, University of London, Adriana Romero, Montreal Institute for Learning Algorithms, Aparna Ratan, Facebook, Lisha Li, Amplify Partners, Mathili Mavinkurvei, Sightline Innovation and more. The first three episodes are now available for download, and you can subscribe to the podcast here to keep up to date with our latest discussions. 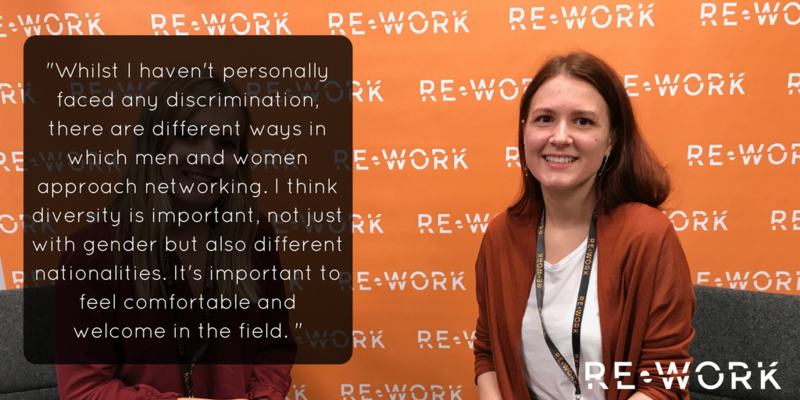 Nikita Johnson, founder and CEO of RE•WORK discusses the motivation behind the Women in AI series. The episode touches on how she came to found the AI events company, and shares some exciting insights of the upcoming Deep Learning Summit and AI Assistants Summit in London, highlighting some of the influential women who will be sharing their research at the event. Antonia Creswell, Antonia is a PhD candidate at Imperial College London, in the Bio-Inspired Computer Vision Group. Her research focuses on unsupervised learning and generative models. She received her masters in Biomedical Engineering from Imperial College London with an exchange year at the University of California, Davis. 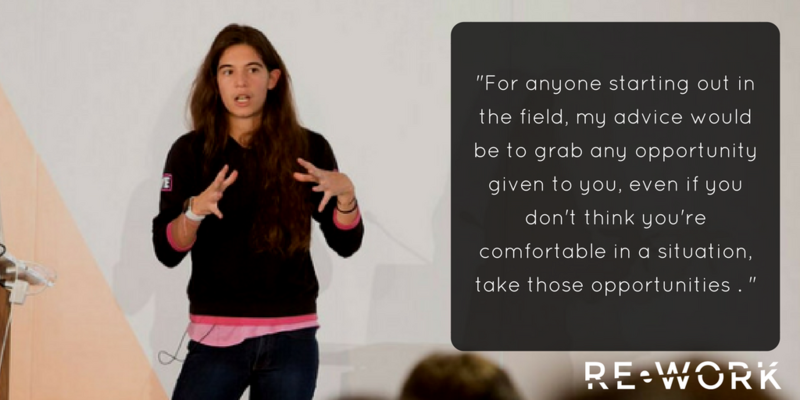 Antonia has interned at Twitter (Magic Pony), Cortexica and UNMADE. In this episode we discuss the implementation of generative modelling to synthesise new data samples, and the challenges faced in this work. Understanding public opinion is important in many applications, such as improving company's product or service, marketing research, recommendation systems, decision and policy making and even predicting results of elections. Social media is a very powerful tool to transfer information and express emotions for users and a rich source of data that enables researchers to mine public opinion, but social media is a breeding ground for rumours that get miscommunicated into fact - how can we use AI to help eliminate this? Next week we'll be hearing from Ira Kemelmacher from Facebook and the Allen School of Computer Science who will discuss her work in using AI to learn lip sync from audio. Don't miss out - subscribe here to keep up to date with the latest episodes. If you're keen to support women working in AI, join us for the Women in AI in Machine Intelligence Dinner in San Francisco on January 23. Throughout the evening we will hear from leading female minds in machine intelligence research and applications as well as enjoying a champagne reception, three course meal and wine. Our confirmed speakers are Shivani Rao, Seniro Applied Researcher at LinkedIn, Been Kim, Research Scientist at Google Brain with Cristina Scheau, Engineer Manager, Computer Vision, Applied Machine Learning at Facebook and Annie Liu, Research Scientist, Machine Learning News Feed from Facebook as our sponsors for the evening.